HOSIERY From Ski to Hike to Run: Top Trends in the Performance Sock Market. Outdoor Essentials Socks, whether they're built for downhill ski runs, tough trail hikes or just a scenic walk, are continuing to refine themselves through technology and style. Regardless of activity, customers are demanding socks that are comfortable, form-fitting, durable and versatile. Advances in knitting techniques and new fibers are turning socks into superheroes for the feet — and for the environment. Here's a look at what's new for 2019. 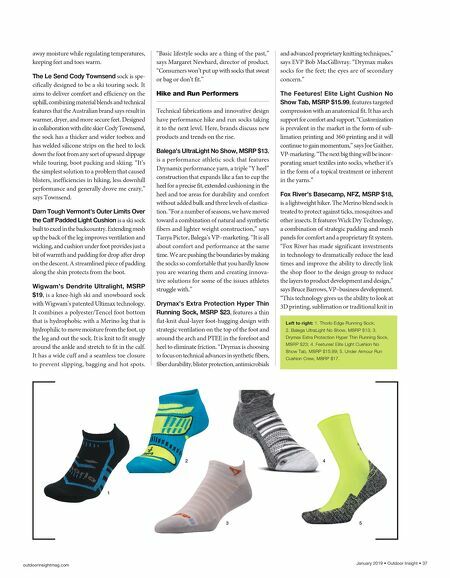 Ski Socks On Tour The ski and snowboard sock category is evolving to keep up with the performance demands of backcountry skiers who need breathable socks for uphill climbs and comfortable, warm socks for downhill runs. Just as they do in their garments, this high-performing consumer wants versatil- ity and breathability in their socks. Cushioning, fabrications and unique graphics are all key. And brands are responding. Falke's Ergonomic Sport System SK6 Ski Sock, MSRP $60, is the newest addition to Falke's ski sock collection. The SK6 is designed to offer "immediate power transmission and comfort" for advanced skiers. It features ultra-light cushioning for immediate shoe contact. The Merino wool mix provides fast moisture wicking and high insulation. Farm to Feet's Top Sheet Collection Ski Socks, MSRP $25, new for Fall 2019, come in three designs — the Telluride, Mammoth and Jamaica. The socks are inspired by ski and snow- board culture and the locations they are named for. "When designing these socks we wanted to create something visually exciting that captured elements of their locations," says Dane Nester, Farm to Feet creative director. Each style in the Top Sheet collection is made with ultra-soft, 19.5- micron U.S. Merino wool and feature full density cushioning in the shin and bottom of the foot and reinforcement around the ankle. 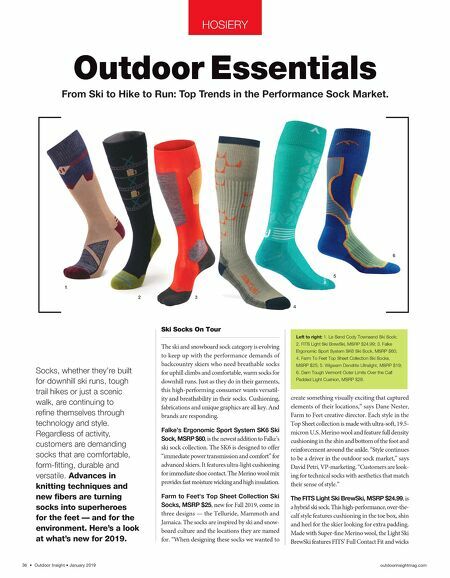 "Style continues to be a driver in the outdoor sock market," says David Petri, VP-marketing. "Customers are look- ing for technical socks with aesthetics that match their sense of style." The FITS Light Ski BrewSki, MSRP $24.99, is a hybrid ski sock. This high-performance, over-the- calf style features cushioning in the toe box, shin and heel for the skier looking for extra padding. Made with Super-fine Merino wool, the Light Ski BrewSki features FITS' Full Contact Fit and wicks 36 • Outdoor Insight • January 2019 outdoorinsightmag.com 1 2 3 5 6 4 Left to right: 1. Le Send Cody Townsend Ski Sock; 2. FITS Light Ski BrewSki, MSRP $24.99; 3. Falke Ergonomic Sport System SK6 Ski Sock, MSRP $60; 4. Farm To Feet Top Sheet Collection Ski Socks, MSRP $25; 5. Wigwam Dendrite Ultralight, MSRP $19; 6. Darn Tough Vermont Outer Limits Over the Calf Padded Light Cushion, MSRP $28.